Not to be confused with Airspace. For the corporation, see The Aerospace Corporation. Aerospace is the human effort in science, engineering, and business to fly in the atmosphere of Earth (aeronautics) and surrounding space (astronautics). Aerospace organizations research, design, manufacture, operate, or maintain aircraft or spacecraft. Aerospace activity is very diverse, with a multitude of commercial, industrial and military applications. Aerospace is not the same as airspace, which is the physical air space directly above a location on the ground. 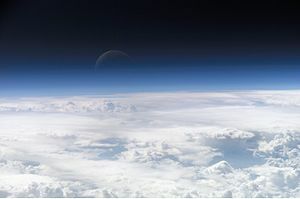 The beginning of space and the ending of the air is considered as 100km above the ground according to the physical explanation that the air pressure is too low for a lifting body to generate meaningful lift force without exceeding orbital velocity. Along with these public space programs, many companies produce technical tools and components such as spaceships and satellites. Some known companies involved in space programs include Boeing, Cobham, Airbus, SpaceX, Lockheed Martin, United Technologies, MacDonald Dettwiler and Northrop Grumman. These companies are also involved in other areas of aerospace such as the construction of aircraft. Modern aerospace began with Engineer George Cayley in 1799. Cayley proposed an aircraft with a "fixed wing and a horizontal and vertical tail," defining characteristics of the modern airplane. The 19th century saw the creation of the Aeronautical Society of Great Britain (1866), the American Rocketry Society, and the Institute of Aeronautical Sciences, all of which made aeronautics a more serious scientific discipline. Airmen like Otto Lilienthal, who introduced cambered airfoils in 1891, used gliders to analyze aerodynamic forces. The Wright brothers were interested in Lilienthal's work and read several of his publications. They also found inspiration in Octave Chanute, an airman and the author of Progress in Flying Machines (1894). It was the preliminary work of Cayley, Lilienthal, Chanute, and other early aerospace engineers that brought about the first powered sustained flight at Kitty Hawk, North Carolina on December 17, 1903, by the Wright brothers. War and science fiction inspired great minds like Konstantin Tsiolkovsky and Wernher von Braun to achieve flight beyond the atmosphere. The launch of Sputnik 1 in October 1957 started the Space Age, and on July 20, 1969 Apollo 11 achieved the first manned moon landing. In April 1981, the Space Shuttle Columbia launched, the start of regular manned access to orbital space. A sustained human presence in orbital space started with "Mir" in 1986 and is continued by the "International Space Station". Space commercialization and space tourism are more recent features of aerospace. Aerospace manufacturing is a high-technology industry that produces "aircraft, guided missiles, space vehicles, aircraft engines, propulsion units, and related parts". Most of the industry is geared toward governmental work. For each original equipment manufacturer (OEM), the US government has assigned a Commercial and Government Entity (CAGE) code. These codes help to identify each manufacturer, repair facilities, and other critical aftermarket vendors in the aerospace industry. In the United States, the Department of Defense and the National Aeronautics and Space Administration (NASA) are the two largest consumers of aerospace technology and products. Others include the very large airline industry. The aerospace industry employed 472,000 wage and salary workers in 2006. Most of those jobs were in Washington state and in California, with Missouri, New York and Texas also being important. The leading aerospace manufacturers in the U.S. are Boeing, United Technologies Corporation, SpaceX, Northrop Grumman and Lockheed Martin. These manufacturers are facing an increasing labor shortage as skilled U.S. workers age and retire. Apprenticeship programs such as the Aerospace Joint Apprenticeship Council (AJAC) work in collaboration with Washington state aerospace employers and community colleges to train new manufacturing employees to keep the industry supplied. Important locations of the civilian aerospace industry worldwide include Washington state (Boeing), California (Boeing, Lockheed Martin, etc. ); Montreal, Quebec, Canada (Bombardier, Pratt & Whitney Canada); Toulouse, France (Airbus/EADS); Hamburg, Germany (Airbus/EADS); and São José dos Campos, Brazil (Embraer), Querétaro, Mexico (Bombardier Aerospace, General Electric Aviation) and Mexicali, Mexico (United Technologies Corporation, Gulfstream Aerospace). In the European Union, aerospace companies such as EADS, BAE Systems, Thales, Dassault, Saab AB and Leonardo S.p.A. (formerly Finmeccnica) account for a large share of the global aerospace industry and research effort, with the European Space Agency as one of the largest consumers of aerospace technology and products. In India, Bangalore is a major center of the aerospace industry, where Hindustan Aeronautics Limited, the National Aerospace Laboratories and the Indian Space Research Organisation are headquartered. The Indian Space Research Organisation (ISRO) launched India's first Moon orbiter, Chandrayaan-1, in October 2008. In Russia, large aerospace companies like Oboronprom and the United Aircraft Building Corporation (encompassing Mikoyan, Sukhoi, Ilyushin, Tupolev, Yakovlev, and Irkut which includes Beriev) are among the major global players in this industry. The historic Soviet Union was also the home of a major aerospace industry. The United Kingdom formerly attempted to maintain its own large aerospace industry, making its own airliners and warplanes, but it has largely turned its lot over to cooperative efforts with continental companies, and it has turned into a large import customer, too, from countries such as the United States. However, the UK has a very active aerospace sector, including the second largest defence contractor in the world, BAE Systems, supplying fully assembled aircraft, aircraft components, sub-assemblies and sub-systems to other manufacturers, both in Europe and all over the world. Canada has formerly manufactured some of its own designs for jet warplanes, etc. (e.g. the CF-100 fighter), but for some decades, it has relied on imports from the United States and Europe to fill these needs. However Canada still manufactures some military aircraft although they are generally not combat capable. Another notable example was the late 1950s development of the Avro Canada CF-105 Arrow, a supersonic fighter-interceptor that was cancelled in 1959 a highly controversial decision. France has continued to make its own warplanes for its air force and navy, and Sweden continues to make its own warplanes for the Swedish Air Force—especially in support of its position as a neutral country. (See Saab AB.) Other European countries either team up in making fighters (such as the Panavia Tornado and the Eurofighter Typhoon), or else to import them from the United States. Pakistan has a developing aerospace engineering industry. The National Engineering and Scientific Commission, Khan Research Laboratories and Pakistan Aeronautical Complex are among the premier organizations involved in research and development in this sector. Pakistan has the capability of designing and manufacturing guided rockets, missiles and space vehicles. The city of Kamra is home to the Pakistan Aeronautical Complex which contains several factories. This facility is responsible for manufacturing the MFI-17, MFI-395, K-8 and JF-17 Thunder aircraft. Pakistan also has the capability to design and manufacture both armed and unarmed unmanned aerial vehicles. In the People's Republic of China, Beijing, Xi'an, Chengdu, Shanghai, Shenyang and Nanchang are major research and manufacture centers of the aerospace industry. China has developed an extensive capability to design, test and produce military aircraft, missiles and space vehicles. Despite the cancellation in 1983 of the experimental Shanghai Y-10, China is still developing its civil aerospace industry. The aircraft parts industry was born out of the sale of second-hand or used aircraft parts from the aerospace manufacture sector. Within the United States there is a specific process that parts brokers or resellers must follow. This includes leveraging a certified repair station to overhaul and "tag" a part. This certification guarantees that a part was repaired or overhauled to meet OEM specifications. Once a part is overhauled its value is determined from the supply and demand of the aerospace market. When an airline has an aircraft on the ground, the part that the airline requires to get the plane back into service becomes invaluable. This can drive the market for specific parts. There are several online marketplaces that assist with the commodity selling of aircraft parts. Functional safety relates to a part of the general safety of a system or a piece of equipment. It implies that the system or equipment can be operated properly and without causing any danger, risk, damage or injury. Functional safety is crucial in the aerospace industry, which allows no compromises or negligence. In this respect, supervisory bodies, such as the European Aviation Safety Agency (EASA ), regulate the aerospace market with strict certification standards. This is meant to reach and ensure the highest possible level of safety. The standards AS 9100 in America, EN 9100 on the European market or JISQ 9100 in Asia particularly address the aerospace and aviation industry. These are standards applying to the functional safety of aerospace vehicles. Some companies are therefore specialized in the certification, inspection verification and testing of the vehicles and spare parts to ensure and attest compliance with the appropriate regulations. Spinoffs refer to any technology that is a direct result of coding or products created by NASA and redesigned for an alternate purpose. These technological advancements are one of the primary results of the aerospace industry, with $5.2 billion worth of revenue generated by spinoff technology, including computers and cellular devices. These spinoffs have applications in a variety of different fields including medicine, transportation, energy, consumer goods, public safety and more. NASA publishes an annual report called “Spinoffs”, regarding many of the specific products and benefits to the aforementioned areas in an effort to highlight some of the ways funding is put to use. For example, in the most recent edition of this publication, “Spinoffs 2015”, endoscopes are featured as one of the medical derivations of aerospace achievement. This device enables more precise and subsequently cost-effective neurosurgery by reducing complications through a minimally invasive procedure that abbreviates hospitalization. ^ "Where does space begin? - Aerospace Engineering, Aviation News, Salary, Jobs and Museums". Aerospace Engineering, Aviation News, Salary, Jobs and Museums. Archived from the original on 2015-11-17. Retrieved 2015-11-10. ^ a b c d e f g Jr, John D. Anderson, (2008). Introduction to flight (6th ed.). Boston: McGraw-Hill. ISBN 978-0-07-352939-4. ^ "United States Bureau of Labor Statistics". Archived from the original on 2013-04-23. ^ "U.S. Bureau of Labor Statistics, Aerospace Product and Parts Manufacturing". Archived from the original on 14 August 2009. Retrieved 2009-07-04. ^ "It's Official: Finmeccanica Is Now Leonardo". Defensenews. ^ "Statistics on Mergers & Acquisitions (M&A) - M&A Courses | Company Valuation Courses | Mergers & Acquisitions Courses". Imaa-institute.org. Archived from the original on 2012-01-06. Retrieved 2013-09-27. ^ "United Technologies To Acquire Goodrich Corporation Complements And Strengthens Position In Aerospace And Defense Industry". UTC. Archived from the original on 2013-10-02. Retrieved 2013-09-27. ^ "Allied Signal And Honeywell To Announce Merger Today - New York Times". Nytimes.com. 1999-06-07. Archived from the original on 2013-10-02. Retrieved 2013-09-27. ^ "What Are The Benefits Of Space Exploration? - Universe Today". 26 January 2015. Archived from the original on 21 March 2015. Look up aerospace in Wiktionary, the free dictionary.